It's time for a round-up of all confirmed transfers thus far! Firstly then, welcome back Saito! I'd be lying if I said I'd be expecting to see too much of him in the starting 11 next season, but the former Young Player of the Year will turn 36 next April, so there's no shame in that! Johnsen and his proven goal scoring record we already know all about. At 34, he too is no spring chicken, but I'm sure he's still got another good season or two left in him. Yu Kijima and Ryo Takeuchi I'm not ashamed to say I as yet know nothing about, but Kosuke Ota is an interesting prospect. Signed from J2 Yokohama FC, who finished in a not especially impressive 10th, Ota made 31 league appearances this year. Still only 21, he was a member of the Under 20 Japan National team which topped it's group at the U20 World Cup last year, so I'm looking forward to seeing what he's made of over the next season or two. No real surprises in those released, and a huge sigh of relief will accompany Aurelio's burden on the wage list being lifted. Fernandinho is currently club-less after Kyoto failed to offer him a contract. With him being set on staying in Kansai, and with his old club Gamba not likely to bring him back to the fold, he may have to look to J2 for a team. Cerezo Osaka might be interested, and they could do far worse for a creative midfielder. After Nishizawa and Aurelio, Toda is the third striker to be released, and it isn't unexpected. With only 12 appearances and one goal in the last two years, it's hard to see where the 31 year old can muscle into our increasingly well stocked front line. With Okazaki, Johnsen, Hara, Omae, and Yajima (who may or may not be off - watch this space), we're looking scarily well equipped up front. Omae only got a few substitute run outs this season, but expect to see more of him in 2009. After the step up from high school football last year, Kenta focussed mainly on having him acclimatise and find his feet in the Satellite League. In the full team, most recently he came on for the final 15 minutes of the JEF United Emperor's Cup tie. His shot which thundered back off the crossbar, not to mention his assist for Okazaki's winner, both bode well for next season. That's all so far for us, but expect more before the start of the new season in March. We still have one more foreigner spot available if needed, or maybe two depending on whether Kim Dong-Sub is given a full pro contract or not. I'm expecting one or two more university or high school signings, but who knows what Kenta and his band of excellent scouts have up their sleeves? I'm looking forward to finding out. OK, that's all for now - check back as the new season approaches for news of signings as they are confirmed! A mind bogglingly inappropriate and staggeringly misguided headline if ever I saw one. 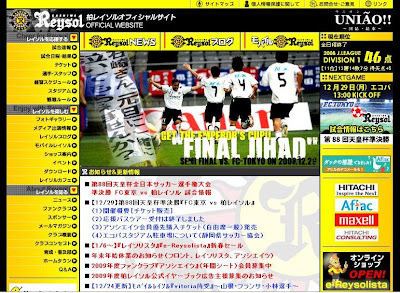 Well, as much as I would like to attend Reysol's very own Holy War, I'm not able to make the game. I already bought a couple of tickets, so get in touch if you're interested in hitting the cup final on Thursday. They're going cheap, but you must be in Shizuoka to collect in the next couple of days! Is Yokohama the most likeable city in Japan? If you ask me, for a nice little day trip out of Shiz, it simply can't be beat! It's got heaps of coastline and related nautical attractions, tons of parks around said coastline, endless shopping to keep the girls happy, years of history and foreign influence to give the city a unique multicultural atmosphere, and awesome architecture from all over the world. Add to that the ease of transport to, from and within the city, the more than ample dining options all around, the brilliantly colourful Chinatown, the Landmark Tower for ridiculously fast elevators and views right over to Mt. Fuji and beyond, the Ferris Wheel and various other fun and games on the waterfront, and you have an all round great place to hang out of a winter national holiday afternoon. And all this is before you even get started on the sport! As if having the baseball stadium and Nissan Stadium both in the heart of the city wasn't enough, the huge Marinos Town sits just minutes away from all the downtown action. A football town to the core, after the unfortunate and messy Yokohama Flügels affair, the locals got together and formed another team to replace the one snatched from them. Respect for that alone. 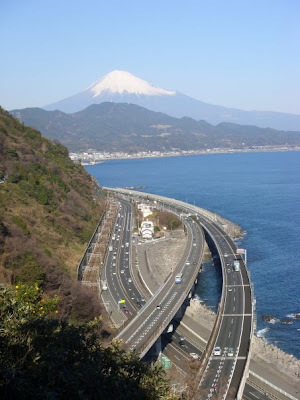 If I ever had to leave Shizuoka behind, Yokohama would be way up on my list of places to make home! Anyway, where was I? Yeah, that's it - while I was off enjoying The 'Hama today, the long-talked about transfer of Frode Johnsen was finally announced. I can only presume we had been waiting until either us or Nagoya were knocked out the cup before making the news official. Most S-Pulse fans have known for weeks the 6 foot 2 Norwegian was on his way to 'Daira. Well, it's a done deal, and the height, presence and proven goal scoring record of the ex international will hopefully be the difference between our 5th place finish this year and an ACL spot next season. In other news, last night the annual J. League awards ceremony took place. Sadly Hara missed out on the young player of the year award to Nagoya's Ogawa, but it was far from a bad night for the Pulse! Who walked off with the award for best pitch in the league? Shimizu S-Pulse. Who picked up the special fair play award across both J1 and J2? Shimizu S-Pulse. And this season's player of the year, Marquinhos, used to play for which team before he moved to Kashima? You guessed it! OK, maybe I'm scraping the barrel with the last one! But the first two, especially the fair play award, is something we can be rightly proud off. The credit for that has to go to Kenta who clearly instils a fair play ethic into his players. You're building a team we can be proud of, and playing the game the way it should be played - thank you Kenta! Well done Tokyo - good luck in the semi. S-Pulse and FC Tokyo face off tomorrow for the fifth time this year in the 1/4 final of the Emperor's Cup. It's this season's last chance of silverware, and the final ticket into next year's Asian Champion's League. Three wins, one draw, ten scored and only three conceded. Given that three of those games took place in our poor first half of the season, with only the 5-1 mauling coming in our resurgent second half, we have reason to be confident. Losing the League Cup final has instilled an even deeper ache among the orange masses for our first title since winning the Super Cup in 2002. The winner will go on to face either Kashiwa Reysol or Sanfrecce Hiroshima in the semi at Ecopa, in what would be as good as a home game for us at least! That being the case, you can be sure more than 6000 will turn up! That was the crowd for the semi between Sanfrecce and Gamba last year at the same venue. Not too surprising given how far it is from both cities! Tomorrow's game kicks off at 1pm. 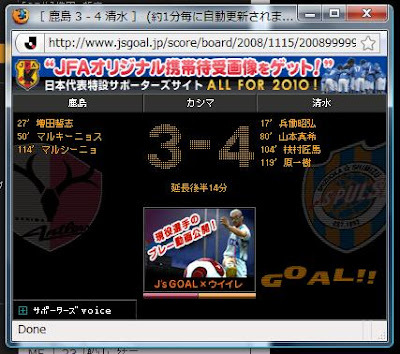 There's no live broadcast available, but for live text, the official S-Pulse homepage does the job, as does J's Goal. Both sites are in Japanese, but you may be able to navigate around by pictures and trial and errors to find what you're looking for. So come on S-Pulse - rewards the hundreds of fans who are heading up to Sendai for this one! Let's have a semi back in Shizuoka! Hot on the heels of transfer rumours and possible stadium expansion excitement comes another snippet of close-season semi-news! Championes, championes! Ole ole ole! Well, bad news of players being sold aside, there is some very exciting news coming from the S-Pulse boardroom. A release last Friday detailed the desire club president Hayao Iwakawa holds to improve access to, increase facilities and car parking provision for, and ultimately raise the capacity of our beautiful home, Nihondaira Stadium. Take a good look, this could be several thousand seats bigger next time you see it! As reported elsewhere, 2008 brought S-Pulse's biggest average gate for 12 years, with the stands being on average 82.1% full for each home game. This is figure second only in the J. 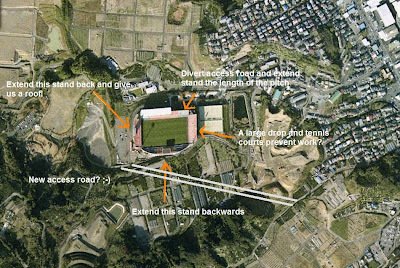 League to Albirex Niigata who attract just under 35000 a week to their 43000 seater Big Swan Stadium. S-Pulse are in discussions with stadium owners Shizuoka City, and while the city are toeing a "we're not saying yes, but we're not saying no" line at present, Iwakawa sounded bullish in his belief the plans would come to fruition. In addition to frequently selling out many areas of the ground each game, the club cited it's ambitions in continental competitions as a spur to growth. You can never stand still in this game, and our president knows that. Quite where the improved access is going to come from is something I'm not too sure about. There's currently the one road which runs up to the ground, and I can't see how it can be improved in any meaningful way. They may have a whole other plan, though, (probably nothing like my idea above!) so for now I'll stick to something I can readily image, and that's stand extensions. Now I'm no architect, but I can see two areas which could be enlarged, and that's, as labelled above, the main stand and The Kop. There is a large amount of open space behind The Kop in particular which has potential for development / an improved bus rotary / car parking etc. If I had a wish, I'd also request a roof for this stand. Rain puts people off in their thousands, and a roof would also help keep in the awesome noise we generate each week. The other option as far as I can see would be the main stand being extended back. The current ellipse shape is charming, no question, but a more angular design would add several hundred onto the capacity, while a second tier would add several thousand... OK, maybe I'm getting carried away, but it's not completely beyond the realms of possibility, and several other fans have mentioned the same thing. For the most part, I'm just made up that our owners have belief and confidence in the future of our stadium, and not only that, they are determined to give us a home to do us justice that is home. Ecopa is great and all, but an hour journey for a home game is no fun. That S-Pulse are committed not to take the easy option and rely on a bigger stadium so far away is massively encouraging to hear. That they want to instead work to make Nihondaira realise it's full potential as a top football venue in Japan is great for Shimizu and Shizuoka. Shizuoka City is famed for it's connection with all things football, and with S-Pulse on the edge of greatness, come on Shiz City bods - let's work together and make the leap from a 4th placed team to a true title contending outfit! Takagi and Aoyama off? Hara Rookie of the Year? The league season is over, and as such transfer news is flying around, increasing in number by the day. Recent bad tidings to take the edge off the good news of Johnsen's impending arrival include rumours of Aoyama to Urawa, and more solid stories of Takagi to Gamba. Given our progress these last few months (not least the fact we were the best team in the country in the second half of the season) potentially losing players to domestic rivals is a bitter pill. The stark reality is, both teams in question have been champions in the last four years, and Reds especially are swimming in money. These potential losses, added to the old news of Yajima probably heading off to Europe, leaves a couple of gaping holes in our first choice starting members. Our back line may take some drastic restructuring, but up front we'd be pretty much set. With international Okazaki, breakthrough hero Hara, and Nagoya's goal machine Johnsen leading the charge, we should have the finishing touch which in it's absence cost us so dear the first half of this season. Hara has just been nominated as one of the best three youngsters of the 2008 season. If he wins the Rookie of the Year award, it will mean S-Pulse players would have won the title twice as many times as the nearest other team. Results announced December, Monday 22nd. Any confirmed transfers will be reported on here as soon humanely possible. The Shizuoka Derby Lives to Fight Another Day! 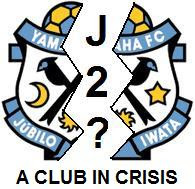 Although for a while it was looking very much like Shizuoka's second team were about to bid farewell to top flight football, bless their little cotton socks, they just about managed to beat a J2 team and stay up! S-Pulse fans can now look forward to the home and neutral derbies next year. What with Ecopa being our stadium too, we don't actually have an away derby these days! Well, joking aside, well done Jubilo on staying up. Finishing in the top five every year isn't as much fun without your rivals in the bottom half of the table to make you feel superior. 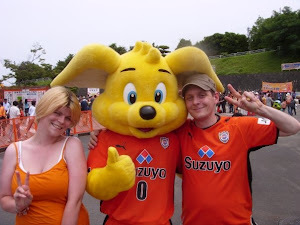 :) The final score on the day was 2-1 to Jubilo, 3-2 on aggregate. Five short years ago, who would have thought it!? In 2003, Júbilo narrowly missed out on the chance to defend the league title (their third) they had won the previous season. That blow was somewhat softened by claiming the Emperor's Cup title instead. The previous six seasons had reaped three J. League titles, a Nabisco Cup crown, and an unprecedented three consecutive appearances in the final of what is now the Asian Champions League. A brand new 50000 seater stadium had just opened ten minutes from Iwata to house a fan base which frequently outstripped the 17000 capacity Yamaha, and their achievements totally eclipsed even those of S-Pulse, who were also busy racking up titles. With all this, you could have forgiven their supporters for feeling pretty confident in the future. Five years down the line, things have gone from bad, to worse, to a level completely unimaginable a few seasons ago. Júbilo are just 90 minutes away from relegation to J2, from likely losing the handful of young, decent players they have, and probably worst, from being laughed at for years by S-Pulse fans. The empire enjoyed around the turn of the century has faded, died, and has been pushed far into the past by Júbilo's J1 peers, not least, and most importantly, by us. In 2008 S-Pulse finished better placed (much better placed!) for a third year running, and had far more impressive cup runs. We also recorded a higher average gate than Iwata for the first time since 1999, and that was even without the use of Ecopa to accommodate 30000 for our bigger games - something we did until last year. So how could things get any worse for Shizuoka's fallen giants? Well, starting the 2009 season in J2 would be a start! That was the very real prospect their fans woke up to on Sunday morning. That they barely avoided automatic relegation to J2 was bad enough; it was only Tokyo Verdy's inferior goal different which meant Iwata finished above an automatic relegation spot. This gave them a second chance in the promotion / relegation series against J2's third placed Vegalta Sendai. The first leg on Wednesday finished 1-1, and now it's all back to Shizuoka for the game which decides it all. The match sold out in hours, and Sendai are bringing down a huge following to see (they hope) their triumphant return to J1 after relegation in 2003. With the away goal, and home advantage, the J1 team are clearly favourites to avoid the drop, but if the last three promotion / relegation games have taught us anything, it's that you can never underestimate the underdogs. The last three all went the way of the J2 challengers. I've been agonising for days over who I want to win this one, and I've come to the conclusion that I want Sendai to send Júbilo down. Heck, Júbilo would already be down if we hadn't gifted them the derby last month, and that's surely more than enough charity from us. I know I'd miss the derby if Iwata drop; it's the highlight of the season and the easily the biggest home game of the season, but that's football, and there'll be more than enough Shizuoka match-ups in the future. I recently came across this photo from around 2005, when we were looking none to clever ourselves. J. League 2008 is over! I wasn't at the game, or watching on TV, as I was deep behind enemy lines at the Yamaha Stadium watching Jubilo crash to defeat at the hands of Omiya. The defeat puts them into the promotion / relegation series with Sendai. The second, and home, leg for Jubilo is next Saturday, so I'll probably wander over to Iwata again, yellow t-shirt in hand. ;-) While we'd all like to see Jubilo drop, I'd seriously miss the derby next season should Jubilo go down, so it's win win for many S-Pulse fans. The fact they even have to play in this series is a humongous embarrassment to all connected with the club, so even if they stay up, you could argue they will have suffered enough! The last three pro / rele ties have all gone the way of the J2 side, so Jubilo are up against it! The story of the day today was in Chiba, where the miracle escape was made even more miraculous by the fact they were 2-0 down before they came back to win 4-2. Losses for both Jubilo and Verdy meant they leapfrogged both teams to preserve their J1 status. Well done Chiba and especially Alex Miller who truly did perform a miracle! Well, we went out on a high, and we have every right to look forward to our Emperor's Cup 1/4 final with optimism. Opponents FC Tokyo were the team on the receiving end of Chiba's four goals today, and as a result were displaced into 6th place by us who finished this season a respectable 5th. Had Aurelio put away the last minute penalty back against Omiya earlier in the season we would have equalled 2006 and 2007's finish of 4th. No matter - it's been a roller-coaster season and we ended it on a high. 5th place also brings with it a cool 40 000 000 yen. Nice! Now just bring on the cup on the 20th! Emperor's Cup FInal Tickets On Sale Now! Never mind that nobody has the slightest idea who is going to be in it, tickets are on sale and going fast for the Emperor's Cup final! What with S-Pulse in the quarter finals, and closing out the season in good form, it may well be worth getting your hands on a ticket or two. Even in the worse case scenario of us getting knocked out in the next game, when the two finalists are decided on December 29th, you can rest assured there will be a mad scramble for tickets. That being the case, even if you don't fancy the day out in Tokyo, you will no doubt be able to sell them on to someone else. Without fail, the Emperor's Cup final on New Year's Day attracts a full house to Tokyo's National Stadium. With several well supported and trophy-hungry clubs such as Nagoya, Marinos and our very own S-Pulse still in the fray, (not to mention FC Tokyo for who it's as good as a home game!) you can bet that this year will be no different. The last league game before it has been played. The last of the tickets have been sold - the game is totally sold out. The bullet trains to Tokyo the morning of the game are all either full or very close to it. All that remains is for Shimizu S-Pulse to march out side by side with Oita Trinita on Saturday in 2008's Nabisco Cup Final! The route to the final, which started back in March, has been long and filled with tension, derbies and goals. 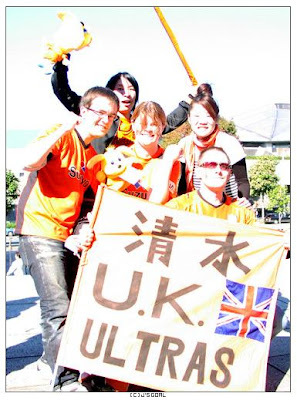 In summary, here is S-Pulse's road to the Kokuritsu, with UK Ultras article linked where available. S-PA WILL WIN ON SATURDAY!!! S-Pulse can play a full strength team of the type which recently disposed of titles chasers FC Tokyo (5-1 away), Kawasaki (2-0) and Gamba (3-1). Oita are missing first choice keeper through injury. Oita have scored less goals than Sapporo who were relegated to J2, what? five games ago? Oita have lost three from their last four, scoring only once. That goal scorer is suspended. Kenta Hasegawa experienced the last time we won the Nabisco in 96 as a player, and the last time we lost a cup final as manager. He is NOT about to let that happen again! The hundreds who are marking their spots in the queue days before the game are the same - we are simply aching for victory. Oita are undeniably one of the most negative teams in the league. They may have scored the third least in the league, but they have also conceded the least - seven less than leaders Kashima Antlers. Saying that, we've breached that defensive line three times in our two meetings this year, so we clearly know what to do. At our last meeting, we blew a two goal lead at their place to draw 2-2. That was back in early August. I believe that was two different sides playing each other. Since then we've well and truly found our form and feet, while Oita have been severely faltering. Indeed, Oita have conceded as many goals in their last five games since keeper Nishikawa was injured as they had in their previous SIXTEEN. I could ramble on for hours, but I'm going to call a it a day here. I know as well as anyone that form guides, histories and what people think will happen on paper can count for nothing once the game kicks off. 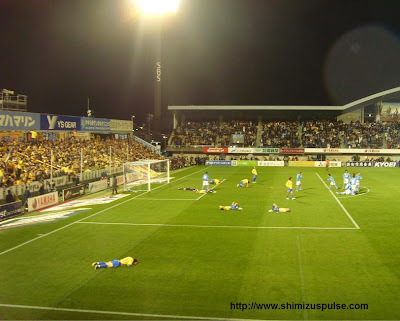 Oita will be desperate for a glorious end to a season in which they've surprised so many. They won't want to make the long journey home empty handed. If it is to go their way, I just prey it's not a result of an anti-football 1-0 snooze-fest, or, God forbid, a penalty shoot out. There's been only three goals in the last four finals, and a third of all finals have gone to penalties. Saturday is going to be HUGE. It's going to be MASSIVE. 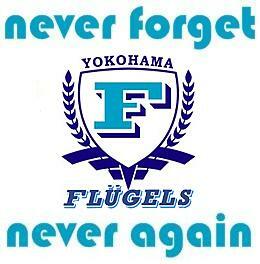 So Oita and S-Pa, it's down to us to do our bit - let's both come to play football and make it a final to remember! All I ask now is this: To S-Pulse's team of young, hungry heroes, you get out there and you bring that trophy back to Shimizu!! Then jump in your team bus and join us in our party by the sea! The whole of Shizuoka is willing it! I get the feeling Gamba must be really starting to hate us. First we put them out the Nabisco Cup in the semis at their home and end their hopes of defending their crown. Then we ensure the thundering momentum which helped sweep them past Urawa in the semi of the ACL came to a shuddering halt by turning them over 3-1 today at Nihondaira. At the same time we all but ended what hopes they had of a title challenge. Taking that into consideration and I wouldn't begrudge them a little ill will towards the oranges of Shimizu! Feel free to use this as a wallpaper! A near capacity crowd packed in early and expectations where high from both ends of the ground. Gamba who on Wednesday had won 3-1 away in Saitama were missing Endo through suspension, but were coming for all three points. They needed nothing less to get their title charge back on track. Failing that, the nonsense that even if they win the ACL they won't automatically get to defend their title, and they are clearly desperate to finish in the top three to ensure international football next year. Despite the incentive Gamba had, and, when you look at it realistically, the lack of any real goal to aim for S-Pa (Title - no chance. ACL qualification - very unlikely. Finishing above Jubilo - already secured. J1 football next year - already secured), despite all this, the game never felt in doubt, as a team off the back of five wins in six marched on to six wins in seven. Edamura has been in form recently, and not least of all against Gamba! After doing them in in the league cup, he was there to put us one up on 38m in a goal not entirely unlike his second against Gamba in the league cup second leg. He was also there to score one of the easiest of his career moments into the second half. A surging run down the right from Hara saw him put a perfect ball into the six yard box which beat both the keeper and defender and left Edamura with the simplest of jobs to put it in the net. Our third just minutes later and was the result of a mid-range Okazaki effort getting a wicked deflection off a defender. It totally wrong-footing the keeper, and as the ball rolled almost in slow motion into the bottom corner the beleaguered goalie tried in vain to get back across goal. For the faithful behind the goal it was party time! Gamba threw everything they had at us, but the best they could do was grab a 75th minute consolation from a corner. 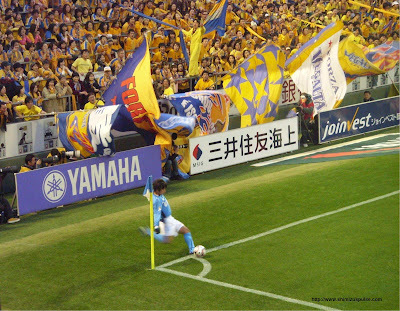 Kaito was a wall between the sticks, at one point making a double-stop from point-blank range. Having total confidence in your keeper is an awesome feeling! The after-game celebrations had the added spark that every second word from people's mouths seemed to be "Kokuritsu!" or "Nabisco!" The buzz was palpable! We're surging into the final in red-hot form. Oita, with just one goal from their last 360 minutes of football and three points from twelve, have been stuttering severely of late. The desire for a win next week is achingly apparent around Nihondaira. Oita surely won't be too pleased to see us in such pulsating form, and that coupled with the sheer will power of our supporters, we're going to bring that trophy home. Next week - bring it!!! And to end, a pic taken from just outside the stadium. Gorgeous. 英語の王者の旗！　S-Pulse's Theme Song in English! 王者の旗。Oja no Hata. Now Available in English! It's the song you've heard each time S-Pulse complete another home victory. It's the song to which everyone raises their scarves and then belts out around Nihondaira. It the last thing most opponents hear as they start to think about the long, pointless journey home. And it's the song where, if you're like me, you hum along with the versus before singing the chorus twice as loud as the person next to you to make up for not knowing the words! Well feel left out no more, for help is here! I have just completed transliterating the lyrics into the English alphabet so you can sing along with ease, but not only that, I've also translated the song into English so you can understand exactly what you're singing about! A full transliteration can be found here, along with the English version here. Have a look, let me know what you think, but most importantly, next time we win, blast it out with all your heart!